Grandparents hold our tiny hands for just a little while, but our hearts forever!! Grandparents are a delightful blend of laughter, caring deeds, wonderful stories and love. Grandparents Day is a day for celebrating the connections between the generations. The purpose of this day is to honor grandparents and to give grandchildren an opportunity to show their love for them. To make children realize about the strength, information, guidance, care and love their grandparents can offer to them, K.R.Mangalam World School, Paschim Vihar organized fun-filled activities for the students of Pre School, Pre-Primary and class 1 on 9 September,16 . 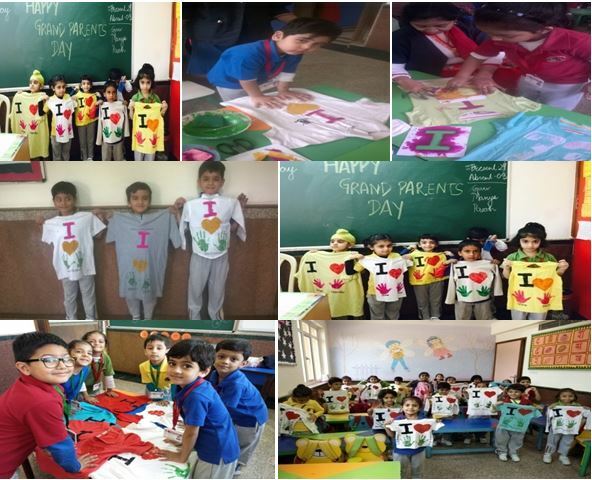 The pre schoolers made a pot which they gifted to their grandparents with their pictures on it, whereas the pre-primary students printed a T- shirt expressing “ I LOVE GRANDPARENTS” with their handprints and gifted it to their grandparents. As we sow a seed and then nurture it into a big and fruitful tree in the same way class 1 students planted a sapling and gifted to their grandparents which will be a reminder of their love towards them that will keep blooming every day. All these activities enlightened the gratitude towards their Nana/ Nani and Dada / Dadi made each one of them realize their importance in the life of our tiny tots.